Slow Food Toronto has had a busy year with many enticing and delicious good, clean and fair food events. Ones that stick out in my mind are a dinner we hosted with the famed Terroni restaurant which featured a menu designed entirely on stale bread to bring attention to food waste and food access around the world. It was a hundred times better than it sounds! We also had an educational evening, where the owners and employees of local, artisanal food purveyors, such as Moray Tawse of Tawse Winery and Tony Cobb of Fogo Island Co-Operative Society, spoke about why they do what they do and their passion for quality and sustainable food. In September of this year, we hosted a tour of K2 Milling, located just an hour outside of Toronto. On the tour the group had a chance to discover the world of local heritage grains and learn how they are milled and processed from third-generation milling and flour / grain expert Mark Hayhoe. An almost extinct trade, Mark explained how over the past century over a hundred small mills in the GTA area have closed down or merged with larger companies. The event culminated with mouth-watering sandwiches made from K2 Milling flour and a tasting of Toronto Distillery Co. spirits made entirely from local and organic corn, wheat and barley. Our next event — a dinner in support of The Newcomer Kitchen, Syrian cooking and Terra Madre day —is planned for December 10th. We are pleased to be partnering with The Depanneur and The Newcomer Kitchen, a fast-growing pop-up dinner initiative in Toronto, to offer a Syrian menu using local and organic ingredients. 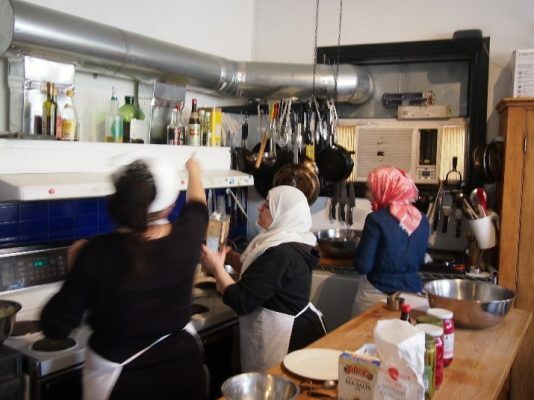 Through this event we aim to celebrate the rich tradition of Syrian cooking and the success of the Newcomer Kitchen at improving the lives of newcomer women in Toronto. It also falls on Terra Madre Day — the perfect day for celebrating the diversity and abundance of our planet’s recipe repertoire.